NORTH ATTLEBORO, Mass. 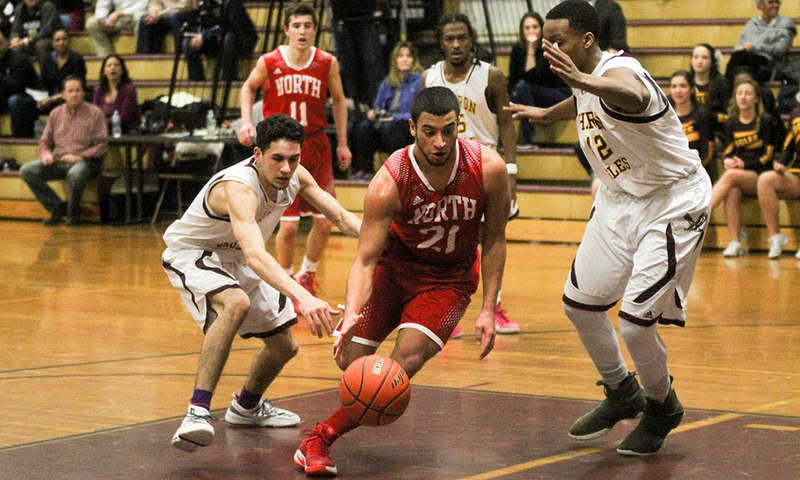 – The North Attleboro boy’s basketball team used a total team effort on both offense and defense, resulting in a 54-52 victory over the Sharon Eagles on Tuesday night at Ken Pickering Gym. It came down to the final play for the second straight game for Big Red, but this time the final basket fell in their favor. With the Rocketeers up 50-46, Sharon’s Jimmy Fitzhenry hit a three to cut the deficit to one. North Attleboro’s Chad Peterson then responded with a mid-range jump-shot to push the North’s lead back to three. Fitzhenry came back and hit another big three to tie the game late in the quarter. North Attleboro did not score on their next possession but the Eagles couldn’t break the stalemate with their offensive possession either. North Attleboro head coach Sean Mulkerrins called a timeout and, out of that timeout, the Rocketeers swung the ball around. Eventually the ball ended up in the hands of Jonny Friberg, who turned and missed his first bid but caught his miss and put it right back up and in to give North a 54-52 lead with 2.5 seconds left. Sharon tossed up a half court shot but it hit the backboard and fell to the floor to give North the victory. “For us as a program that’s trying to learn how to win, we’re still learning but tonight goes a long way in pressing upon them the value of playing hard every possession,” Mulkerrins said. In the first quarter North Attleboro came out of the gates hot scoring 19 points. Defensively, the Rocketeers switched from a 2-3 zone to a man to man defense possession by possession. “The logic behind the defense was, Sharon has some kids with really good foot speed and some certain match ups on our end we didn’t feel really great about, we also thought that by mixing up our defense it will mask some of our problems but also give them a pause, they run a ton of set plays and playing some 2-3 would take it out of them some,” Mulkerrins said. In the second quarter it was mostly all Sharon, who outscored the Rocketeers 15-6. The Eagles started off the quarter with an 11-0 run to take a 23-19 lead. However, a couple of nice passes from Brent Doherty (13 points) to Friberg (14 points) kept North in the quarter going into halftime only down by two. The third quarter was back and forth between both teams. North Attleboro senior Thomas Reynolds really was the engine that made the Rocketeers go in the frame. He scored six of his eight points to go with six rebounds and an assist in the quarter to help push the Rocketeers. 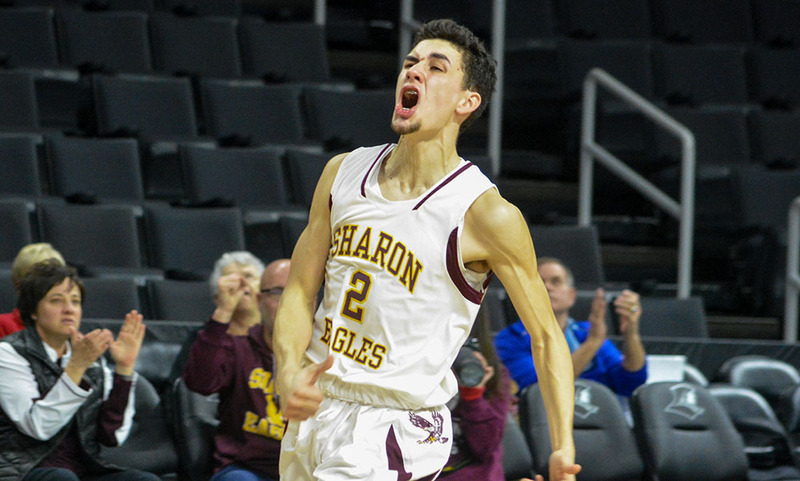 For Sharon it was senior Ricardo Ripley (17 points) who kept the Eagles in the third quarter, scoring Sharon’s last four baskets and keeping the Rocketeer lead at three going into the final quarter. North Attleboro (5-4 overall, 2-3 Hockomock) will take on Davenport rival Stoughton at home on Friday at 6:30, while Sharon (2-5, 1-4) will travel to Canton the same day for a 7:00 tipoff.